Borax is a natural, white powder, mineral of colorless crystals that dissolve in water easily. Its chemical formula, Na2B407-10H20, is a combination of sodium, boron, oxygen and water. It has a high alkaline structure with a pH level of 9.3. The International Union of Pure and Applied Chemistry, (IUPAC), name is sodium tetraborate decahydrate. Other names are: sodium borate, sodium tetraborate, sodium pyroborate and sodium biborate. This mineral has been mined near the surface of Death Valley, CA since the 1800's. Today, it's mined deep within the ground in Boron, CA of the USA. Generally, it's considered to be safe for the environment. However, large amounts can be harmful to plants or other species. Exposure to the environment should remain minimal. It's often confused with boric acid, but they're not the same. Boric acid is produced when Borax reacts with sulfuric, hydrochloric or other acids. Boric acid has a pH level of 5.0 and a higher level of toxicity. The chemical formula for Boric acid is H3BO3. It's IUPAC name is Trihydrooxidoboron or Boric acid. It's other names are: hydrogen borate, boracic acid, borofax, orthoboric acid or acidum boricum. As a mineral it's name is sassolite. Generally, there are no special precautions for handling. Although, with long exposure take precautions by wearing gloves, goggles and a small face mask. Allow for proper exhaust air ventilation. It has a low, acute, oral and dermal toxicity level. It does not cause skin irritation to "intact" skin but may cause skin irritation to cuts or abrasions. It may cause irritation and redness with prolonged contact. It's non-carcinogenic, does not accumulate in the body and is poorly absorbed through skin. It's not a skin sensitizer. It won't heal skin, directly, but replaces skin damaging agents. The Henkel Corporation is the name behind 20 Mule Team Borax and some well known brands including: Dial soaps, Purex laundry detergents, Right Guard antiperspirants, göt2b hair styling products and Loctite adhesives. Read more information and watch videos, now! STORING: Place it in dry indoor location. CAUTION! Always keep it away from children and pets. LAUNDRY BOOSTER: Laundry can be cleaner without the use of bleach or bleach substitutes. Stabilize lather. Lift stains and wash them down the drain. Discover excellent cleaner power without fading colors. HOMEMADE SOAP: Use Borax for making soap at your discretion. Ask yourself, "What function will it provide?" All soap is antibacterial by nature. Your homemade soap may not need a cleaning booster. In this case, it would be not be needed at all. On the contrary, if it would add function to your homemade soap then follow proven soap recipes, by trusted professionals. HOW TO MAKE SOAP: Homemade laundry soap, dish soap, bar soap, liquid soap, homemade shampoo. Tips for cleaning dishes in dishwasher and sink. Dr. Hulda Clark shares tips and homemade recipes! CAUTION! 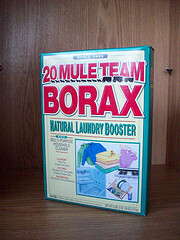 Borax is not intended to be ingested. The estimated lethal dose, (ingested), for adults is 15-20 grams and less than 5 grams can kill a child or pet. Inhalation of its dust may cause respiratory and skin irritations. It may cause nausea, gastrointestinal upset, vomiting, abdominal pain, diarrhea, headaches, lethargy, minor sore throats, minor nose irritation or very mild lung irritation. Exhaust ventilation should be used to minimize airborne dust generation or accumulation. In excessive dusty occupational or other settings, respirators, eye goggles and gloves may be needed.